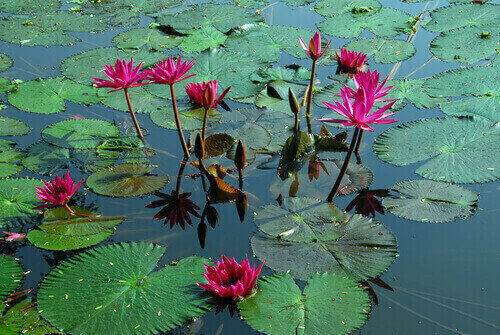 Many of the techniques used to produce stunning and vibrant pond plants are the same applied to traditional gardens. Just a few of the things you’ll want to consider include the plant’s height, color, and the most ideal growing conditions. Here are some additional guidelines you should consider. There is nothing more boring than using the same plants with similar colors, shapes or growth habits. There is a huge selection of plants that can be used in or around ponds, so make sure your selection is diverse in color, shape and size as this will create more visual interest. Different species of plant will vary in how big they can get. A common mistake which is made by amateur pond owners is failing to consider the maximum growth size. Factoring in the width and height of each species of plant you intend to add will ensure you have sufficient space for further growth in the future. Ponds and water gardens will differ in the lighting they receive. Certain plant colors, such as orange, white or yellow will brighten areas which are shady, while violet and blue will reduce the intensity which results from the rays of the sun. Understanding this can allow you to structure your plants in such a manner where the lighting is maximized to create an appealing effect at all times of the day. Green is an important color for ponds because it produces a calming effect so one technique you can use is to add plants with different green shades. Some species of aquatic plants will require more sunlight than others, or greater depth. Plants that require maximum sunlight will need six hours of sun exposure per day and should not be obstructed by any objects. You should know basic information on each plant you intend to add to your pond and any questions you don’t have answers to can be answered by your plant provider or by doing research online. Pond owners are highly recommended to use a nice mixture of plants which are aquatic, as this brings the best results. Some of the top species that are very popular in ponds and water gardens include water lilies, water lettuce, and the lotus. You will want to add some submerged plants as they will produce oxygen within the pond which is beneficial for any fish that are present. Other species include marsh marigolds, dwarf cattail and cardinal flowers. For smaller ponds tall plants work best when they are placed on the sides of waterfalls, as they will frame it and create an interesting view. Bigger ponds give you more space for experimentation, and will give plants the necessary room to spread and grow. There are some species of plants which thrive near moving water, so you will want to add them along the path of streams.